Nice post; do you have many flyers from your club days? I was in a well known bookshop recently and came across a large coffee table book devoted to the club flyer. remarkable. Yeahhhh was the first place where i felt a real sound system, reggae, dub, jungle... wow i been on summer 1994,its very nice for me found this info, respect!! Vic Valium was the DJ at the Sir George Robey when I lived in the neighbourhood during the summer of 1987 and make it my local. He spun some great stuff. I saw some memorable live shows there that summer as well, including Desmond Dekker, Jayne County, John Cooper Clarke, Hank Wangford Band, Buckwheat Zydeco, Lick The Tins and others. It was also a good place to keep the party going after festivals at Finsbury Park. I was sad to see it gone when I returned for a visit in 2004. Of course it got me guessing who the band was - I reckon Flux of Pink Indians? I was working in London , though supposedly based in the West Country at the Weekends. I lost a few of those to popping in to the Far Side on a late Friday evening. I still remember with passion the good laughs in that fine place , the chance to talk to anyone and everyone and the confusion about how many rooms there were in the venue whilst circulating around it. Let's hope people continue to want to entertain others and don't become obsessed too much about how much profit they will grab. Choci ran Choci's Chewns off Wardour Street, the place for trance n' techno in London. The Liberators also ran a night with the Zero Gravity crew at around the same time. Boney Slackburn on the flyer was the guy who ran the Far Side nights - along with Dj Stab. They were really the legal side of techno and trance events in the East End, and by the far the most drug fuelled psychedelic nights in London at the time - hand in hand with the booming free party scene. Yes remember Choci's Chewns and also went to some of those Zero Gravity nights at Club414 in Brixton. I played here in Abbfinoosty. Late 80's. It was a brilliant gig and a great packed crowd that just turned up to see music. Awesome. Nice article. 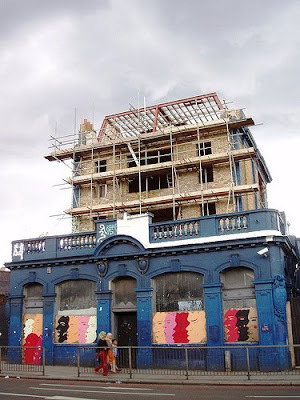 I found it whilst searching for the George Robey - very sad to see it gone, I didn't know. I played there twice in the early-mid 1990s, with a folk-punk (ish) band called Ye Fungus. Back to the Planet played the first time as well - a brilliant evening in a great venue. @Anonymous Although Bony & DJ Stab could be described as part of the Far Side crew, the guy who ran it went by the moniker of Farmer. I'm still in contact with Bony & Farmer. We used to play pool in there after Arsenal games in the 90's, always a bit sketchy and on the edge, full of smoke, but safer than the Silver Bullet. Great tunes too. Some mod friends have posted pics from nights there in late 80s early 90s. The band has Sir George Robey banner behind it. Neil Lacy was the resident DJ in the late 80s, A coloured Irishman a great Character. Mekons 1985 or 87 - lovely night - mostly a couple of ex-pat Americans in the house that night - I guess Brits lost interest in the Mekons by that point of the Thatcher era - The colonials always loved em - Hard to be Human indeed! I ran some Indie nights at the Robey usually on a Wednesday around 1986-90. Some I remember more than others but some of the bands that I booked, were That Petrol Emotion, My Blood Valentine, The Young Gods, The June Brides, Bam Bam and the Calling, Voice of the Beehive, The Chills. Fun Times.